Gift-giving made easy. 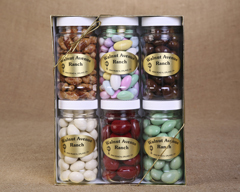 Jars of roasted California almonds, Jordan almonds, chocolate cherries, and chocolate covered almonds. Six economical 10 oz. 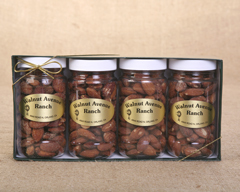 jars of the same roasted almonds as in our Savory 6 pack. You get twice as much Roasted/Salted, BBQ, Smoke, Garlic, Honey Roast and R/S Blanch almonds for less than twice the price. 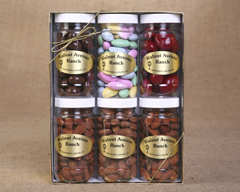 A large 6-jar Variety pack - enough goodies for a family or a small crowd. Contains 10 oz. 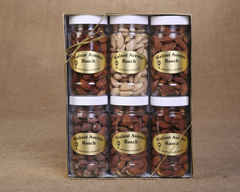 R/S Almonds, 7 oz. R/S Pistachios in shell, 10 oz. BBQ Almonds, 13 oz. Jordan Almonds, 10 oz. Butter Toffee Almonds and 10 oz. Fruity Cranberry Snack Mix. A varied gourmet assortment containing 10 oz. Roasted Mixed Nuts, 12 oz. Yogurt Almonds, 12 oz. Chocolate Fruit Basket (chocolate cherries, apples, apricots, blueberries, and cranberries), and 10 oz. Tamari Almonds. 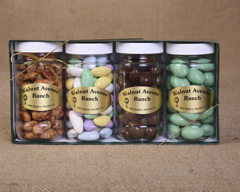 Green mint chocolate covered almonds, Jordan almonds, butter toffee almonds, and milk chocolate covered almonds. Four 5 oz. 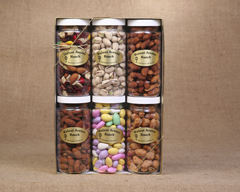 jars containing Barbecue flavored almonds, Roasted Salted Smoke almonds, Roasted Salted Blanched almonds and Roasted Salted almonds. Classic and popular for gift-giving. 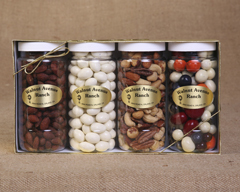 Everyone is sure to love the variety of flavors in our six-jar almond gift pack. Contains 5 oz. 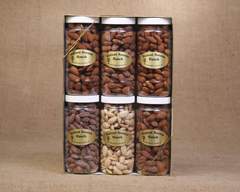 each of Roasted Salted, Barbecue, Smoke, Garlic, Honey Roast and Roasted/Salted Blanch almonds. Green mint chocolate almonds, Jordan almonds, milk chocolate almonds, butter toffee almonds, red chocolate cherries, and yogurt almonds.